This is a standard type of position in which White would play the marked stone as a wedge. 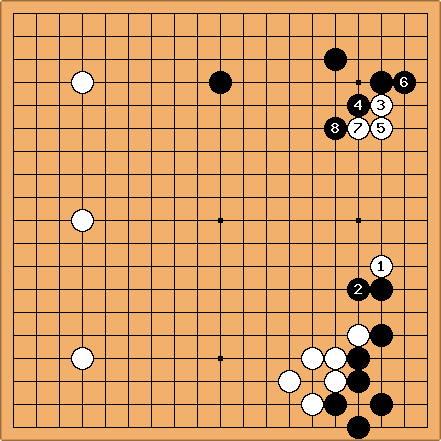 Whichever side Black plays, White will be able to form a base, with a two-space extension. This works because White played in the centre of an open area nine lines wide. Assuming only a narrower space of seven lines, playing in the centre affords only a small base. erikpan: So assuming black plays tenuki; what is the best way for white to continue after this and move the group out into the centre? Is 'a' correct, or is it too slow? Or should it be 'b' for some reason? This isn't necessarily bad, because Black's long-knight's-jump enclosures still have weaknesses (aji) compared to the tighter enclosures of the first diagram. Another way of playing is for White to try to make the most possible use of the possibilities at the two ends. After 1 and 3, White plays 5 in order to tie up the stones played into a group. The game might continue like this. How does this compare with the other result from the starting position? White is much closer to having settled a group in this area. On the other hand White has lost some possibilities against the corners. 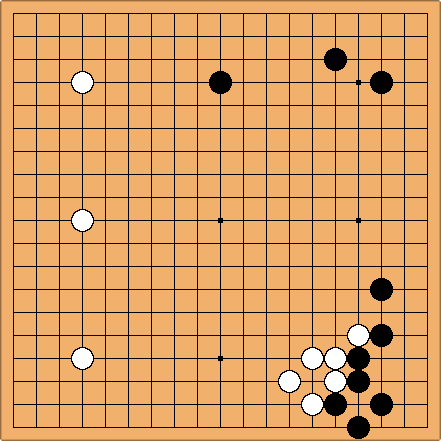 There remains a weak point at a, but in general Black has gained security in each of the corners. Therefore there is a conflict to be seen between making life for a group, and avoiding aji keshi. This position was first published in the British Go Journal (BGJ 115, Summer 1999). The space on the right side is eight lines wide. This method of play by White corresponds to the pattern discussed above - see what you can get using 'both ends'. Black 2 is best. This continuation, with White 1 played to leave aji on the top side, represents success for White: a tight fit into the right side. Michael Redmond-He Xiaoren 1996-06-20, from the 1996 NAMT - the North American Masters. Black starts the middlegame before playing out a joseki in the lower right. 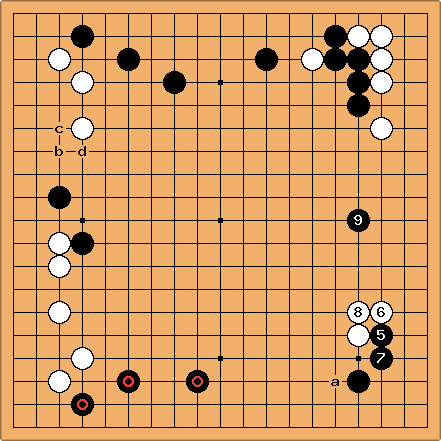 Black's idea is to make the most of the marked group, which is solid but low. Black 9 allows White a, which is a good direction of play in these circumstances. 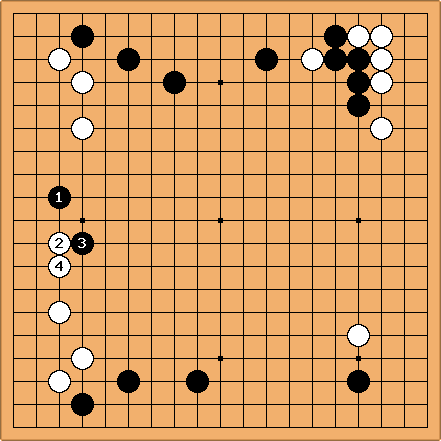 Later in the fighting Black had sente to play Black b, White c, Black d and stabilise the group on the left side. Andy Pierce: I think it is helpful to distinguish between use of the wedge for the purpose of establishing a group on the side (making territory) as contrasted with the purpose of efficient reduction in the opponent's sphere of influence. In particular, the Redmond game seems to be an example of the latter.